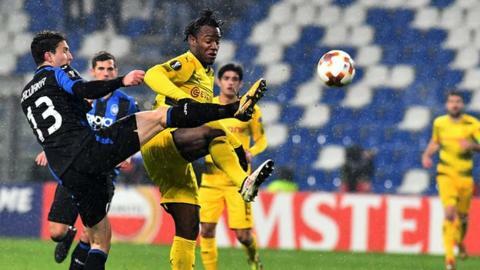 Michy Batshuayi says he heard "monkey noises in the stands" as Borussia Dortmund knocked Atalanta out of the Europa League in Bergamo. The on-loan Chelsea forward tweeted: "2018 and still racists monkey noises in the stands ... really ?! Dortmund won 4-3 on aggregate after Marcel Schmelzer cancelled out Rafael Toloi's opener for the Italians. Last month, Atalanta received a suspended one-game stand closure after Napoli defender Kalidou Koulibaly was subjected to racist chants during a Serie A game. Match ends, Atalanta 1, Borussia Dortmund 1. Second Half ends, Atalanta 1, Borussia Dortmund 1. Mario Götze (Borussia Dortmund) wins a free kick on the right wing. Corner, Borussia Dortmund. Conceded by Hans Hateboer. Attempt blocked. André Schürrle (Borussia Dortmund) left footed shot from the centre of the box is blocked. Assisted by Marco Reus. Substitution, Atalanta. Andreas Cornelius replaces Rafael Toloi. Substitution, Atalanta. Andrea Petagna replaces Marten de Roon. Corner, Atalanta. Conceded by Mario Götze. Mario Götze (Borussia Dortmund) is shown the yellow card. Mattia Caldara (Atalanta) wins a free kick on the right wing. Goal! Atalanta 1, Borussia Dortmund 1. Marcel Schmelzer (Borussia Dortmund) right footed shot from the centre of the box to the top left corner. Attempt missed. Marco Reus (Borussia Dortmund) right footed shot from outside the box misses to the left. Assisted by Lukasz Piszczek. Substitution, Borussia Dortmund. Alexander Isak replaces Mahmoud Dahoud. Attempt saved. André Schürrle (Borussia Dortmund) left footed shot from the centre of the box is saved in the top left corner. Assisted by Marco Reus. Attempt saved. Alejandro Gomez (Atalanta) left footed shot from the centre of the box is saved in the bottom left corner. Assisted by Bryan Cristante. Leonardo Spinazzola (Atalanta) is shown the yellow card. Attempt missed. Marco Reus (Borussia Dortmund) right footed shot from a difficult angle on the right misses to the left. Assisted by Lukasz Piszczek. Attempt saved. Michy Batshuayi (Borussia Dortmund) left footed shot from the left side of the box is saved in the bottom left corner. Assisted by Mario Götze. Corner, Atalanta. Conceded by Sokratis. Attempt missed. Josip Ilicic (Atalanta) left footed shot from the centre of the box misses to the left. Assisted by Bryan Cristante following a fast break. Offside, Atalanta. Leonardo Spinazzola tries a through ball, but Bryan Cristante is caught offside.